'06 North's Max Plante scores in Sunday's championship win over '06 East. The seemingly unstoppable run for the '05 North team came to a screeching halt on Sunday, as '05 East handed the northern squad its first loss of the weekend in the 2005 Division championship. Oliver Moore led the way with two goals for '05 East, which withstood a late challenge by '05 North, during which Gavin Jensen scored twice to pull '05 North within one at 3-2. '05 East shut down the comeback attempt and added an empty-net goal to cement the 4-2 victory. Charlie Brandt stopped 22 of 24 shots in the second half for '05 East. In the third-place game, '05 South rode a four-goal outburst to a 6-3 win over '05 West, with Drew Stewart potting a hat trick and Gracyn Sawchyn dishing out two assists. Both players were among the division's leading scorers for the weekend. Oliver Moore scored two goals to lead '05 East to a 4-2 win over '05 North on Sunday. Gavin Jensen scored two goals late in the second half to pull '05 North within striking distance in Sunday's loss. Gretta Pioske scored twice and handed out two assists while Stella Retrum added two goals of her own as '05 West thumped '05 East 5-2 on Sunday afternoon. Avery Achterkirch tallied the fifth goal for '05 West, while goaltender Caylin Cantwell made 18 saves on 20 shots to ice the win. Scoring for '05 East were Josie Lang and Payton Schwantes. '05 South downed '05 North 5-1 in the third-place game behind goals by five different players. Edina skaters Hannah Halverson and Sami Hankinson finished as the game's top scorers with two points each. '06 North scored four straight goals late in the first and half and early into the second half to pull away from '06 East for a 6-3 win in the 2006 Division finals. Max Plante scored two goals and added two assists in the win for '06 North, while Ben Miller led '06 East's effort with a pair of helpers. Kambryn Hendrickson and Caleb Heil combined for an 18-save shutout as '06 South blanked '06 West 6-0 to capture third place. Brodie Ziemer and Bobby Cowan led '06 South with two goals each in the win. Simon Seidl (4) scores for '06 East in Sunday's loss to '06 North. A late power-play goal by Makayla Moran wasn't nearly enough in the 2006 Girls Division championship game, as Team North skated past Team South by a final score of 3-1. Izy Fairchild, Hallie Klavu, and Ilsa Lindaman all scored for Team North before Moran's goal, cementing Team North's 3-0-1 record for the weekend. Josie St. Martin scored for Team East late in the first half of the third-place game, with spurts of two and four goals by Team West on either side of Martin's goal. Bailey Gray led Team West in scoring for the day with two goals and an assist, while Kaitlin Groess stopped al 10 shots she faced in the second half of the win. Izy Fairchild showed no mercy at the Selects, scoring at will and leading the North to the championship on Sunday. An uninterrupted three-goal start and four-goal first half for '07 East proved to be the difference, as Sunday's 2007 Division championship ended with '07 East topping '07 West 5-3. Aiden Grossklaus recorded a hat trick for '07 East, with the team's other two goals came from Cole Braunshausen. Owen Corkish tallied three assists in the win for '07 East. '07 South scored four straight goals in the second half to come away from the 2007 Division's third-place game with a 5-2 win over '07 North. Luke Portner, Bryce Wiitala, Jacob Faith, Tucker Johnson, and Lukas Sawchyn all scored once for '07 South to earn third. Owen Corkish had three assists for '07 East on Sunday afternoon. A 4-1 deficit with time running out was no match for Team West, as the girls in red scored three times in the last eight minutes of regulation to force overtime before Maya Engler netted the game-winner just 33 seconds into the extra session. The goal was Engler's second of the game, with Hanna Jones, Mackenzie Jones, and Toriana Anderson also scoring in the win for Team West. Despite losing the in the championship, Team North's Kaiya Sandy turned in an impressive performance with a hat trick. At the 19:32 mark of the first half, Team East's Ella Hornung scored in the third-place game, cutting Team South's lead to 2-1 and seemingly settling the game into a seesaw battle. Team South racked up seven goals in the second half, with Avery Kasick and Katherine Petrie leading the group with two goals each in a runaway 9-1 win. Senja Leeper also scored twice in the win for Team South, with Lorelai Nelson scoring a goal and dishing out two assists and Kasick adding a pair of helpers in the barrage. 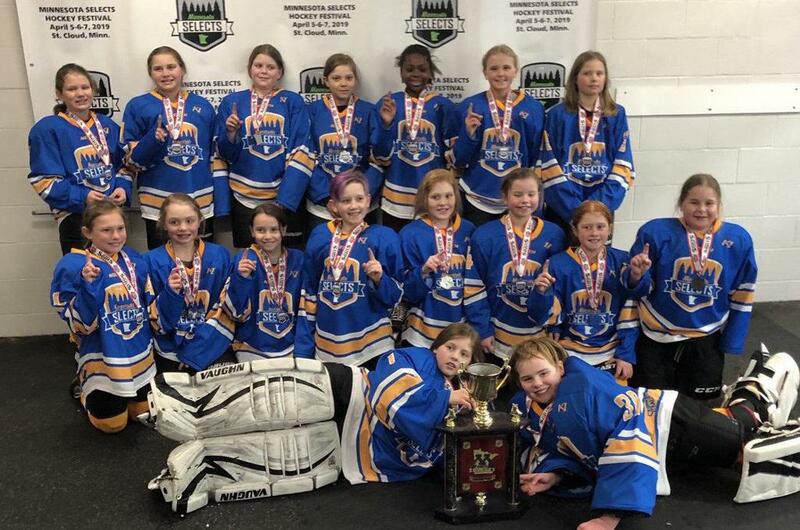 '07 North's Kaiya Sandy recorded a hat trick in Sunday's title game loss to '07 West. Goaltenders Hudson Smith and Gavin Jones combined on a shutout between the pipes to lift '08 South to a 3-0 win over '08 in the 2008 Division title game. Michael Berchild, Cole Bumgarner, and Gavin Karl scored one goal each for '08 South, and Bumgarner ended the weekend as the division's leading scorer with six goals and seven points. Quintin VeDepo scored twice and Avi Kasargod added a goal in the second half as '08 East downed '08 West 4-1 in the third-place game. Riley Zupfer scored in the first for '08 East, and the lone goal of the game for '08 West was scored by Joseph Erickson. Ander Rajala ranked as one of the weekend's leading scorers with four goals and six points for '08 North. Team East raced to a 4-0 lead in the first half and never looked back en route to a 7-1 win over Team North in the finals of the 2007 Girls Division, paced by two goals each from Woodbury's Alaina and Brooke Gnetz. Emily Pohl, Addison McLay, and Ella Bond all tacked on single goals for Team East, which featured Elliana Engelhardt as one of the weekend's leading scorers with three goals and five points. Alaina Gnetz led the team in scoring with three goals and six points. Behind three goals in the second half, Team South downed Team West 4-1 in the 2007 Girls Division third-place game. Cate McCoy scored twice in the second frame to lead Team South, with single goals coming from Gina Russo and Brielle Newton. Alaina Gnetz scores in '08 East's championship win over '08 North on Sunday. Gavin Sattler scored at the 15:36 mark of the second half to give '09 South a thrilling 3-2 victory over '09 North in the championship game of the 2009 Division. Henry Feltmann and Karsen Herman also scored for '09 South in the win, while Gabriel Swenson and Anton Klint tallied goals for '09 North. '07 West's Nolan Fitzhenry racked up a goal and two assists to be the third-place game's highest scorer, but his team fell just short as '09 East edged '09 West 6-4 on Sunday morning. Tony Timmerman also scored two goals for '09 West, with Riley Klava recording two scores in the win for '09 East. Team North breezed past Team West 6-1 in the 2009 Girls Division finals, with Taylee Manion of Hermantown notching a hat trick in the the title game. Manion concluded the weekend with four goals and four total points, tied for first in the division with Team North counterpart Anna Bjorkman of Moorhead. Team South edged Team East 3-2 in the third-place game, scoring three times in the second half to erase a 2-0 deficit. Maya Godfrey led the way for Team South with two goals in the win, including the game-winner late in regulation with the score tied at 2-2. Team South's Delaney Miller assisted on both of Godfrey's goals and scored South's second goal to tie the contest.